Depressing rainy day here, not helped by a jobsworth bank teller locking the bank door dead on the dot of 5pm! 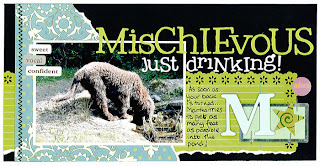 However life is a bit sunnier because of this fun page created for a challenge on Shimelle's blog. The big heart is a Heidi Swapp giant ghost heart shape - I adore these! The page features baby Martha enjoying her very festive squeeky ball! Definately her favourite at the moment! But then she is a Christmas baby so shouldn't be a surprise! She's getting so huge, she's only just gone 4 months and already weighs 70lb! 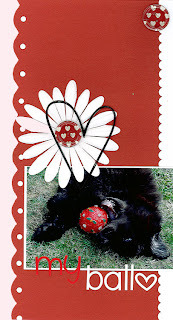 The second challenge went up today on the A True Friend Challenge blog, some fantastically inspiring pages... and mine! My page is yet another 6x12 page.. I may be becoming a tad obsessed with this size! It also features something that had become rather rare to be seen on one of my pages - a metal rimmed tag! I'm making it my personal crusade to bring these back!! I just love your layouts katy - they are just stunning.